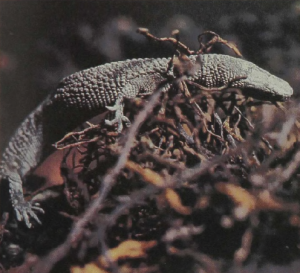 This small, dark-brown earless lizard was, in 1960, known from a half-dozen specimens taken during three-quarters of a century. Just one year later, an anthropological field party discovered another specimen in Sarawak, Northern Borneo. Literally dozens of specimens have since turned up in the same area, and we now have a far better understanding of their life history and anatomy. The results confirm that they I ie close to the group from which snakes arose.